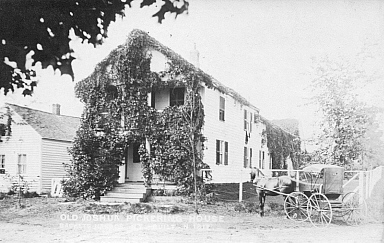 Joshua Pickering, of Massachusetts, born about 1763, son of Samuel Pickering and Elizabeth Brackett of Rockingham Co., New Hampshire, was an early resident of Sackets Harbor, Jefferson Co., New York, and built his home on West Main St. about 1817. 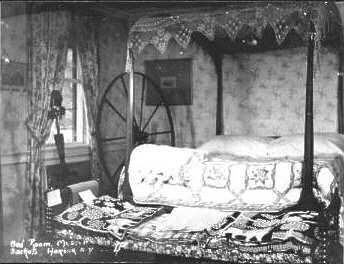 The property he purchased, which abutts the War of 1812 Battlefield, already had one building on it, later known as the Pickering Cottage. The cottage pre-dates the time when the Pickerings owned land in the village and is said to have served as a hospital during that war. Joshua died in 1822 and the home passed to his son Capt. Augustus A. Pickering, who owned several ships on the Great Lakes, and was the first person to sail a ship into the port of Chicago. Before his death in 1844, Augustus renovated the home, adding a second story with porch. His daughter Olivia, wife of New York State Lt. Gov. Allen C. Beach inherited the property. 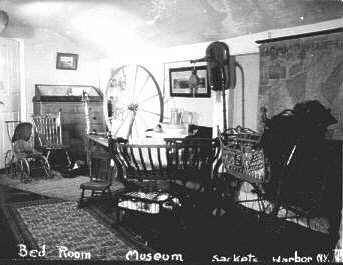 Their daughter, Amy, wife of Col. William V. Ewers, willed that the home be converted to a museum after her death and in 1941 the Cottage and Pickering-Beach Museum were deeded to the Village. The last curator, Mrs. G. Stanley Smith, died in the early 1980s and the museum was taken over by a village appointed Museum Board. The condition of the buildings declined until renovation was again necessary in the 1990s. In June 1998, with funding from New York State and the Sackets Harbor Historical Society, renovation of the Museum was completed and it was re-opened to the public.